Dies R Us: Come Look Out My Window! And welcome back to the Wednesday post of our Inspiration Blog! Whether you are a first time visitor, or a regular, be sure you check out the postings for the entire week! We have a great bunch of gals who are full of ideas to jump start your card making & crafting & get your creative juices going into overdrive! Today I'm going to share a birthday card. Although my first intention was to make this open at the top, because of the size of the die, I knew I would have to go with a side opening instead. In one of my earlier posts, I told you how to make these lacy cards into frames, so I won't repeat myself. For today's card, I used Spellbinders Reflective Moment, Cheery Lynn Lace Corner Deco B and Die-namites Spring Window. I admit, I had looked at the Spellbinder Reflective Moment several times and not ordered it because I thought it might be too large for a card, but that is NOT the case at all! I will be ordering more of this size as they are perfect! As you can see from the top of this card, it opens from the side. when it is closed, all you will see is the beautiful lacy frame. I cut the Spring Window die twice. Once in black & once in green. I wanted the vines to be green & it was easy to snip them from the green cut & glue them over the original black die. Using one of the three dies that come in the Lace Corner Deco B set, I applied those to the corners & finished it off with the smallest die from the Reflective Moment set which I popped up on pop dots. Nothing hard or complicated and you end up with a beautiful card that will impress someone with how creative you are! That's the beauty of using dies! Don't forget to stop at our store & check out all the hundreds of dies we carry in stock. And when you have finished shopping, be sure to stop at the Dies R Us Challenge Blog for a chance to win a prize! Until next Wednesday, have a great week & happy cutting! Just love your card Sherri! Of course the cat watching the bird is too cute! BEAUTIFUL use of this adorable die cut Sherri! Great job! Thanks for wonderful inspiration! lovely scene. I love those corners! I absolutley love this and it made me smile. 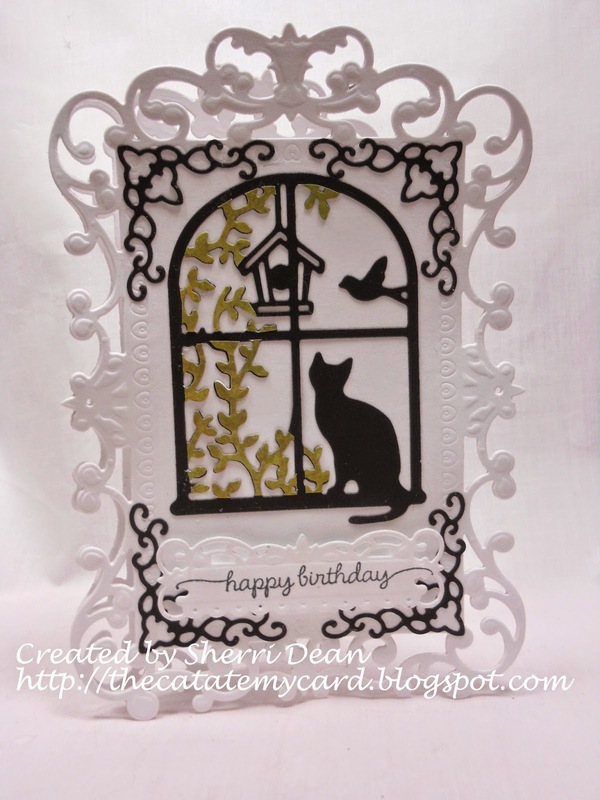 That is exactly where you would find Mr. Kitty if there is a bird outside the window.What a beautiful die shaped card it is so light and airy. I love those corners and that is a beautiful label for the sentiment. GREAT sentiment...I haven't seen that one before. Great balance and design...Beautifully crafted! Sunset at the Shore . . .
Birthday Card For A Princess!